"Established Power" vs. "Rising Power"
While in China, U.S. Secretary of State Clinton dares to ask what may be the 21st century’s toughest question. 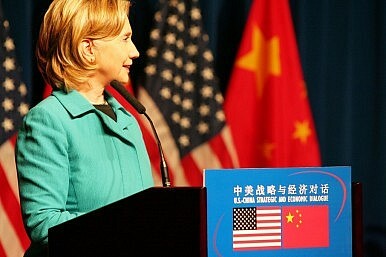 With U.S. Secretary of State Hillary Clinton making another trip to the Asia-Pacific, the U.S. State Department posted her comments from a joint press conference today with Chinese Foreign Minister Yang Jiechi online. Note the term “established power.” Very interesting choice of words. In my own very humble opinion, this is the major question of the 21st century and for American foreign policy going forward. I thought the comment shows a very clear understanding of the stakes involved on a historical level. The U.S.-China relationship is clearly the world’s most important. Nothing will drive the globe’s dynamics more than this. And with both nations armed with nuclear weapons, there is an added reason to make sure tensions are kept to a minimum. With flashpoints in the South China Sea, Iran, the ongoing chaos in Syria just for starters, the importance of the bilateral relationship will only grow as the years pass. Will China’s rise be accompanied by peaceful competition and avoid any of the armed conflict that past great geostrategic changes in world politics usually bring? In my opinion, there is no bigger question for the world to ponder.